After the drama of the 1986 World Cup quarter-final against Argentina, England’s next major tournament would bring far fewer memorable moments to commentate on. Davies may have been exclaiming “magic moments for the Republic of Ireland” as they beat England at Euro ’88, but there weren’t many from an English perspective as Bobby Robson’s side lost every game – Davies describing ‘highlights’ of two of their losses. The pressure was mounting on Robson, with Davies seeing that in person after a much-criticised 1-1 draw away to Saudi Arabia in November 1988. In the previous part we recalled how Don Revie remonstrated with Davies over comments he made in 1977 and now Robson would do likewise, taking exception to what he had to say surrounding Brian Marwood only being brought on for the closing minutes. “Impertinent,” was the term Robson called Davies afterwards, even the wordsmith commentator admitting in his memoirs he hadn’t heard the term since his schooldays. Italia ’90 would see Davies commentate live three times on England, the first being the group stage win over Egypt that took them through and the last seeing him cover the third-place match against Italy in which he melodramatically howled “oh no, oh no” as the Italians were awarded the decisive late penalty. But the England match at Italia ’90 which saw Davies saw leave a lasting legacy was the quarter-final against Cameroon. On a night that presenter Des Lynam unusually fluffed his lines, Davies was on top of his game. Davies saw England go ahead, then watched on as Cameroon took control and went 2-1 up. But in the closing minutes England were awarded a penalty, one which Gary Lineker realistically had to score to keep Robson’s side in the tournament. For Davies, a man who was masterful at conveying sport as theatre, this was his moment. “Never a more vital penalty for England,” said the commentator, almost whispering the words to stress the tension like Ted Lowe would at the Crucible. Then Lineker converted and the joyous relief followed. “It’s all square,” Davies exclaimed, later going on to describe another Lineker penalty as England won 3-2. Two years after the drama of following England at Italia ’90 came the tedium of covering them at Euro ’92. Davies was holding the microphone for BBC highlights of England’s second game against France. Not that there were many. “The most sterile defensive international I’ve ever covered,” was his damning assessment in his autobiography of the bore draw. Three days later he commentated live on a more memorable England game, but not a happier one as the side surrendered the lead against hosts Sweden to exit the tournament. He would watch on with surprise as Graham Taylor hauled off Gary Lineker, then wax lyrical as Tomas Brolin and Martin Dahlin linked up superbly for the former to score the winner. “Brilliant, brilliant goal,” he proclaimed, as the ball was deftly placed out of Chris Woods’ reach. The tide was turning against Taylor and the ill-fated attempt to qualify for the 1994 World Cup followed. Davies covered a rare highlight with the 3-0 win over Poland in September 1993, as he mused over the passage of 20 years since THAT match between the sides in the same stadium. But the victory only kept England in with a chance rather than giving them the advantage and defeat to the Dutch the following month effectively ended hopes. 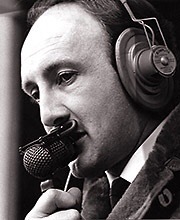 On the last night of qualifying Davies unexpectedly found himself performing a live commentary, as the BBC turned away from England’s increasingly meaningless win in San Marino to the closing stages of the vital match between Wales and Romania which he was covering. It would symbolise a changing of the guard, as the balance of power finally tipped towards Davies and he was given the 1994 World Cup final as well as the two subsequent FA Cup finals. The Euro ’96 final would go to John Motson, but it says much for the esteem Davies was held in at the time that he would get to cover both England knockout games during a momentous tournament on home soil. There was a long wait for England fans to see competitive action between November 1993 and June 1996, Davies at least getting to enjoy Graeme Le Saux’s screamer against Brazil and Rene Higuita’s scorpion kick save when Colombia visited Wembley in 1995. Come the tournament, Davies covered four of England’s five matches – the only one he missed being the win over Scotland. During the group stage he commentated for highlights on the frustrating draw with Switzerland and tremendous win over the Netherlands. But it was the knockout phase where he got his big chance. The quarter-final against Spain was his and exclusively live on the BBC. What threatened to be after the Lord Mayor’s Show as England rode their luck just to stay in the game ended with national joy as they won a “penalty competition” (as Davies liked calling them). The shoot-out would forever be remembered for Stuart Pearce’s reaction after he scored. “Oh yes, what a penalty. And the relief belongs not only to this championship, but to the World Cup of 1990,” proclaimed Davies as he applied words that went well with the pictures. Who would have thought that more than 20 years later this would remain England’s only penalty-shoot-out success? Four nights later came a huge match. England against Germany in the semi-final must surely be the biggest and most talked-about game played on English soil in the last 50 years, such was the interest in it across the country. Davies wasn’t to get the final, but his disappointment over that was significantly offset by the fact he described a far more memorable and highly viewed semi-final. It was a night when he said it best by saying little, letting the pictures tell their own story as fans sang before kick-off and simply but effectively saying “ohhhh noooo” as Gareth Southgate had his decisive spot-kick saved. “You can have nothing but sympathy,” he said of Southgate after a few moments of silence. But it was perhaps in the enthralling first period of extra-time that Davies really stood out during the contest (to use another of his terms). Both sides refused to be inhibited by the golden goal rule and went for it. “How unlucky can you get?” Davies exclaimed as Darren Anderton struck the post, before at the other end Germany had a goal disallowed. “A country’s pulse rate must be beyond natural science,” the commentator observed as viewers across England breathed a major sigh of relief. And then came the often-recalled moment when Gascoigne just couldn’t get a touch with the goal at his mercy. “This is unbelievable stuff,” Davies said, almost laughing as he dwelt upon the mesmerising events occurring before his eyes. It was a heartbreaking night for England, but one in which Davies could feel pride over his commentary. Two years later Davies covered England’s live opening match of the World Cup against Tunisia, with Paul Scholes producing a delightful curler to seal the win in the closing minutes. Davies was purring over that one but admitted he was lost for words a week later as Romania netted a late winner past David Seaman when he was describing highlights. That proved to be his last involvement on England matches out in France, as he was left to make his mark elsewhere – most memorably with his reaction to Dennis Bergkamp’s late winner for the Netherlands against Argentina. Euro 2000 would really mark the final real hurrah for Davies. It was to be the last time he would describe the semi-final of a major tournament, although by then England were long departed after crashing out in the group stage as Davies commentated live on their shortcomings in losing 3-2 to Romania. At the 2002 World Cup his England involvement was restricted to highlights of the forgettable 1-1 group stage draw against Sweden, as it became increasingly apparent Motson was the clear number one. “ITV were live, and welcome to it,” Davies wrote tersely of the Sweden game, as he understandably reflected on how he’d have preferred a much better final match commentating on England at a major tournament. During commentary he would brand England’s display “an utter shambles”. Davies’ last World Cup as a commentator would be mostly remembered for his castigating of the Italians as they lost to South Korea in the second round. England’s 2-0 away win over Liechtenstein in March 2003 was hardly the most memorable game, but it turned out to be the last time Davies would commentate live on the Three Lions – even though the Beeb now held the rights to most qualifiers. By Euro 2004 Davies was increasingly on the fringes. He wrote in his autobiography: “The fact that I was not invited to commentate on a single one of England’s matches, not even recorded, made my position absolutely clear.” Davies was becoming increasingly frustrated with both his diminishing status – his place in the Beeb’s 2006 World Cup squad was not guaranteed – and the way he felt fooball broadcasting was going as Match of the Day moved away from its traditional two main games format. He rejected the BBC’s offer of a new contract and brought his football commentary career to a close when covering highlights of Manchester City against Arsenal 13 years ago this week for MOTD. Coming just days after the death of Brian Clough, it really did feel like the end of an era. But if they thought it was all over, then it wasn’t. Thanks to his versatility, Davies remained in demand covering a variety of other sports and even this year – just months before turning 80 – he could be heard on the BBC’s coverage of Wimbledon. But his legion of fans still wished to hear him commentating on football again and in 2014 they got their wish when he was brought back by MOTD for a one-off appearance to mark the show’s 50th birthday. Even some who weren’t particularly fans of his during his heyday welcomed him back, as social media became awash with nostalgia. But the days of Davies being one of the leading voices of football were long over. The joys of YouTube mean it isn’t hard to find footage of his commentary, including plenty of major England matches. He covered England matches for almost 40 years. He’d described them beating West Germany in 1966 – not that one, but the friendly in February – for ITV and was still active with the BBC a few years after the Millennium as various national team managers came and went during his career. It was a long period of time by any standards. Davies provided the soundtrack to many memorable footballing moments. And sometimes you had to say it was magnificent.